We are collecting your feedback and we are using it to make important decisions! In order to provide you with new, powerful features as soon as possible, we may release some features in BETA status. BETA features provide early access to new functionality that might be included in a future release. These features may not always work, and may not work in all use-cases, however, we are considering them useful enough for implementing in a new release. The primary purpose of BETA Features is to allow you a preview of what is upcoming and to enable testing in a real time environment, so our development team can use your valuable feedback to make technical improvements and integrate them into the application, after testing and reviewing. Beta Features are available as the last menu item, when you go to edit your video. 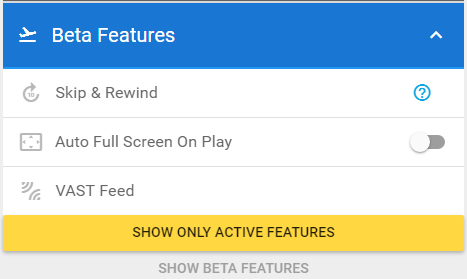 Additional menu will be revealed, when you expand it, all beta features will be listed there and you can apply them on your videos. Allows you to place dynamic ads over your videos. The AdSense is supported and the documentation and tutorials are coming soon. If you would like to submit a fresh idea about the feature which you would like to see in vooPlayer, please refer to this page.